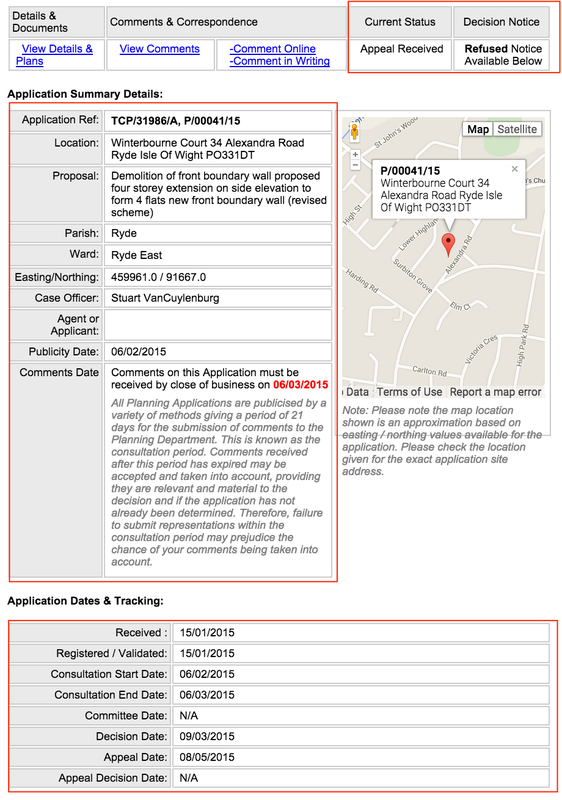 One of the staples that I suspect many folk look to in our weekly local paper, the Isle of Wight local press, is the listing of recent planning notices. archive search (back to February, 2004). It’s easy enough to knock up a scraper to grab the list of current applications, scrape each of the linked to application pages in turn, and then generate a map showing the locations of the current planning applications. 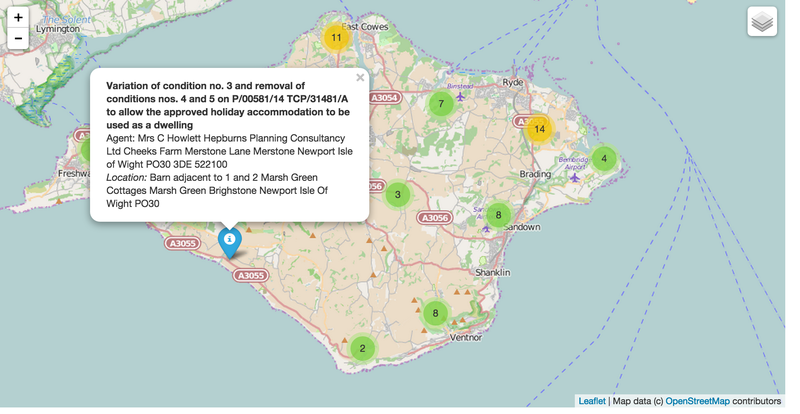 Indeed, working with my local hyperlocal onthewight.com, here’s a sketch of exactly such an approach, published for the first time yesterday: Isle of Wight planning applications : Mapped (announcement). I’m hoping to do a lot more with OnTheWight – and perhaps others…? – over the coming weeks and months, so it’d great to hear any feedback you have either here, or on the OnTheWight site itself. The sketch is a good start, but it’s exactly that. If we are going to extend the service, for example, by also providing a means of reviewing recently accepted (or rejected) applications, as well as applications currently under appeal, we perhaps need to think a little bit more clearly about how we store the data – and keep track of where it is in the planning process. The listings pages also take slightly different forms. All of them have an address, and all of them have a planning application identification number (though in two forms, albeit intersecting); but they differ in terms of the semantics of the third and possible fourth columns, although each ultimately resolves to a date or null value. At the moment, the OnTheWight sketchmap is generated from a scrape of the Isle of Wight Council current planning applications page (latitude and longitude are generated by geocoding the address). A more complete solution would be to start to build a database of all applications, though this requires a little bit of thought when it comes to setting up the database so it becomes possible to track the current state of a particular application. It might also be useful to put together a simple flow chart that shows how the public information available around an application evolves as an application progresses and then build a data model that can readily reflect that. We could then start to annotate that chart with different output opportunities – for example, as the map goes, it’s easy enough to imagine several layers: a current applications layer, a (current) appeals layer, a recent decisions layer, an archived decision layer. A process diagram would also allow us to start spotting event opportunities around which we might be able to generate alerts. For example, generating feeds that that allow you to identify changes in application activity within a particular unit postcode or postcode district (ONS: UK postcode structure) or ward could act as the basis of a simple alerting mechanism. It’s then easy enough to set up an IFTT feed to email pipe, though longer term an “onsite” feed to email subscription service would allow for a more local service. (Is there a WordPress plugin that lets logged in users generate multiple email subscriptions to different feeds? In terms of other value-adds that arise from processing the data, I can think of a few… For example, keeping track of repeated applications to the same property, analysing which agents are popular in terms of applications (and perhaps generating a league table of success rates! ), linkage to other location based services (for example, license applications or prices paid data) and so on. So, this information isn’t available as open data? @ekoner Depends how you define “open”… The data is published on the Council website, but not as data and with non-obvious license conditions. And no geodata. Ah. Problem with that is, you can’t tell if you can use it for commercial puropses. What’s the feedback like on your planning map? We’ve had a lot of building work within a mile of us. I’d be interested in recreating your work for my Wakefield borough. Web coding, not great but I can scrape with beautifulsoup no problem.